Mother’s Day Feast At Bertucci’s! My husband and I usually try to round up the moms for a casual dinner out on Mother’s Day. This year was no different– both of our moms worked until almost seven on Sunday, so we met up with them at Bertucci’s in nearby Massachusetts, which is located in the same mall my husband’s mom works in. Not only did we invite our moms, but we also asked some of the most important “other moms” in our lives to come along. My sister and my cute nephews, as well as our awesome upstairs neighbors who are new parents to an adorable baby Ella, also joined us during our lovely dinner out. We had quite the raucous party of seven adults, two children, and of course a teeny tiny babe! Since I called ahead, we were seated at a great table. I think even if I didn’t put in a call we would have been just fine, since it seems the crowds had already died out by the time we rolled in. Our server was beyond energetic– almost to a point of it being a fault, especially since the last thing she said to us was to take an online survey about our service and dining experience. I hate to say it, but she seemed like she put on a show for us just to get a good review, which was a bit annoying only because she was almost too conversational with us. Anyhow, the service was attentive overall. We all skipped the apps to go straight to the main course. Of course, numerous pizzas were ordered, but I had to complete a bit of menu navigating to craft a satisfying vegan and gluten-free meal. 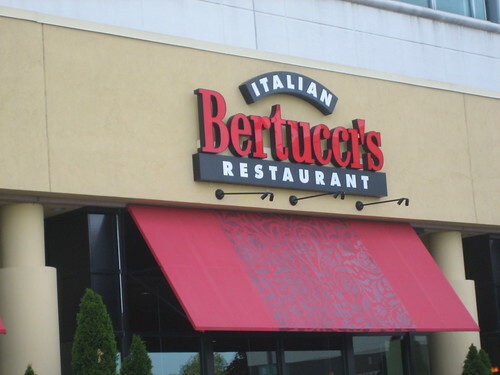 Bertucci’s makes this a lot easier since they do have a dedicated gluten-free menu that was pretty substantial and included lots of easily veganized items. I ordered three dishes: first up, the watermelon, arugula and feta salad without the feta. 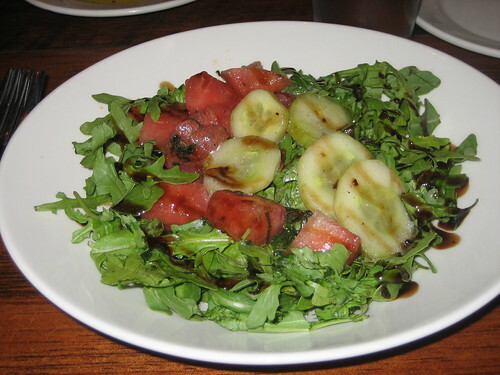 It was very delish with a thick balsamic glaze and olive oil and mint infused watermelon for the win! It was nice to be able to order a vegan and gluten-free salad with interesting ingredients, versus the standard pile o’ lettuce I tend to fall back on. I also ordered two items off of their “small plates” menu, which I believe is a relatively new feature. I told the waitress I didn’t eat dairy, just to make sure the two items I ordered were prepared with oil and not butter. She ensured me that only oil would be used. I got the roasted potatoes. 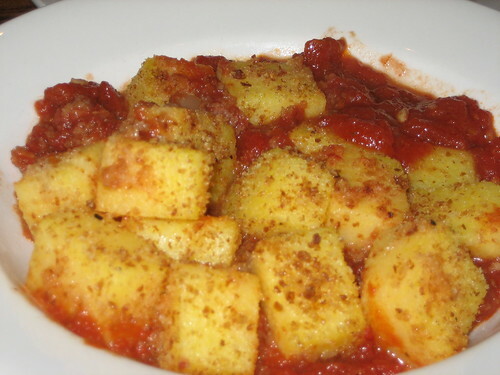 . .
plus the polenta with pomodoro sauce! 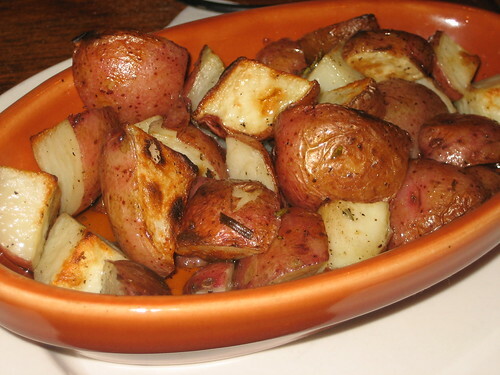 The potatoes were perfect– nice and soft with a slightly crunchy exterior and seasoned with herbs and spices. The polenta though was the real star of the night! First, kudos to Bertucci’s for offering a grain/carb dish that isn’t pasta or made of whole wheat! The polenta was cubed and pan-toasted a bit before being piled on a generous pile of extremely flavorful pomodoro sauce. I feared the dish may be bland, but it was anything but. My mom even ditched her veggie pizza so she could finish off the polenta! Honestly, I would go back to Bertucci’s for the polenta alone! Another nice bonus was that for less than eight bucks for both, the portions were huge! These plates certainly weren’t that “small,” as they are titled! Bravo to Bertucci’s for making us vegans and gluten-free-ers not have to work hard to put together a varied and tasty meal, especially since it is a chain restaurant. You made me proud, but more importantly, you made my stomach full and happy. The best part is there were actually other things on the menu I didn’t order but want to try, like their vegetable antipasto (without cheese) and their Tuscan roasted veggies. It’s nice to know that it is one chain restaurant in which I have plenty of options. Now have I ever told you just how kind and generous our neighbors are? Well, I know I have but I am going to say it again anyway. They had to leave early because of the Ella’s bedtime, but apparently, before we all showed up for dinner, they arrived early to order us dessert platters for the whole table! 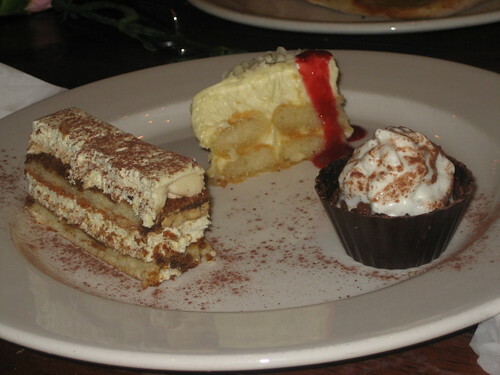 In other words when they left, trays of dessert magically appeared on our table! They were so sweet to do that– I want to thank them here for that wonderful gesture! Though I couldn’t indulge, here’s a pic of what one of the trays looked like. Let’s just say there was this amount of dessert on the table– times about four! Needless to say, my nephews in particular were extremely happy to be able to eat cheesecake, tiramisu, lemon cake, chocolate mousse and chocolate cake all in one sitting! The night was just perfect. In fact it was kind of magical that we were able to assemble all of the moms in our lives together on this one night to celebrate them! These kinds of occasions are unfortunately too rare– I think Mother’s Day should be more like Mother’s Week, or even month! 2 Responses to "Mother’s Day Feast At Bertucci’s!" Thank you for posting, this is very helpful! I became a vegan a year ago and haven’t been back to Bertucci’s since, but it’s great to see there are options. 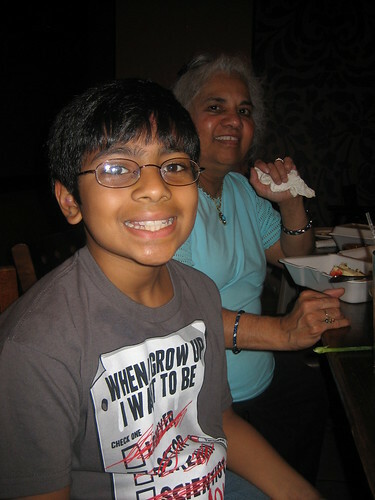 I have a vegan blog, please check it out http://www.veega.co!